Always Floral fouses on creating beautiful wedding flowers for your special day and so much more. We are available to meet with clients at their wedding and reception sites to assist with design plans and ideas. We also help you coordinate the entire table decor to ensure your floral pieces compliment your other selections. Yes, we do care!! 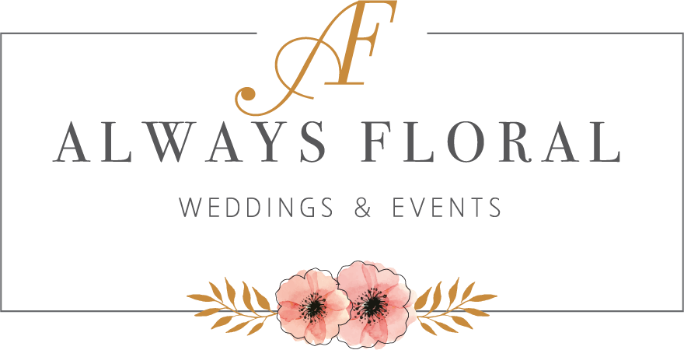 Always Floral designers are available before the ceremony to handle all floral details, which includes setting up, removal if needed after the ceremony, and offer transporting your floral arrangements to the reception, if necessary. Sabrina-Head Designer/Owner recieved her Bachelors from Sam Houston State University with her minor in Fashion design. She received her certification in Floral Design from North Harris County College in 2002. She actively attends Wedding MBA each year in Las Vegas where she stays on top of current and future trends and everything else related to wedding planning. What makes us unique? Meeting the client with ease and listening to their needs and offering helpful suggestions to obtain the most on ones budget. Also, maintaining a close relationship with each and every client is extremely important to us. We are available in the ways that fit your style of communication. We love email, phone conversation and Visits at our studio. There is no guessing as to who will actually be designing your florals. Meet the designer when you come in the first time. Sabrina the owner is available to discuss any questions that may arise.